When kids are growing up in suburbia, they will need some activities in the back yard to burn off their unending energy. Most children, in fact, are pretty predictable when it comes to the toys they want in their backyards. Here are the five things every kid would love to have in their backyards. Bouncing around on a trampoline can be a lot of fun. Though simple jumping motions can be easily mastered, some kids will eventually branch out into other domains. Kids can get off the couch and get out in the sun to get a workout while having fun. 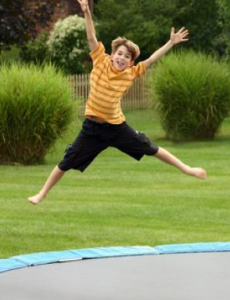 As long as excessive weight is not placed on the trampoline, it should provide exciting outdoor fun for years. Basketball courts can be used for individuals who want to practice shooting, dribbling, or any number of other skills. In most cases, a full-sized court does not need to be installed. A portable basketball hoop can be placed at one end of the driveway. As long as there is some asphalt or concrete to play on, a game of hoops will always be waiting. During the hotter months of the year, swimming pools are loved by children all around the country. With a water slide added for a little extra fun, the neighborhood kids should have a blast as they splash around in the water. In-ground pools are generally the better way to go. Pumps and filters should be cleaned on a regular basis so that no mechanical problems occur. In some cases, hot tubs for the family might even be considered as a great addition for kids and the whole family. A playground is the height of childhood grandeur. As kids roam through the jungle gym, they should have a wonderful time, especially if they are on the younger side. Any good playground should have a slide, a set of monkey bars, and some swings. If parents have built a playground from scratch, they should make sure that the anchor poles are pounded into the ground to a safe depth. Tree houses are a great escape for your kids. They take some degree of skill to construct, so builders should be sure that they have the right tools. A decent supply of wooden beams and planks should be used. The best tree houses will also have roofs so that children can stay out of the rain. They can then play in the tree house whenever they feel like it. Next Article » The College Sustainability Report Card: How Does Your School Measure Up?